quarto worked in partnership with Mark Lusby of the Friends of Derry Walls to support the Siege Museum in delivering a six-month learning and participation programme supported by the Heritage Lottery Fund. We delivered an engaging living history programme with local secondary schools ; a community archaeology programme with Queen’s University Belfast; a Siege Heritage Trail; as well as a well-attended events and talks programme. We also supported the museum directors and staff to develop their skills as they plan strategically for future development, most notably through reconfiguring the ground floor gallery space and seeking Museum Accreditation status. Lore of the Land was a cross-community programme engaging with older residents of the Causeway Coast & Glens area. The project sought to stimulate reminiscence and discussion of local folklore, including participant’s personal stories, in order to explore and share the cultural heritage of Causeway communities. The project was part of the PEACE IV Understanding Our Area: People and Places programme, funded by the Special EU Programmes Body and delivered by Causeway Coast & Glens Borough Council’s Museum Services. quarto contributed a body of folklore research to the project and also facilitated a series of storytelling workshops with local community groups. Portglenone Enterprise Group received Heritage Lottery funding to support the restoration and reuse of the old Northern Bank in the village, replicated in the Ulster Folk and Transport Museum. quarto was commissioned to make interpretive and fit out recommendations, to reflect the past, present and future uses of the bank as a hub for community life. Lough Neagh Partnership aims to address the heritage needs of the Lough and its shoreline on a holistic integrated landscape basis. As part of the Lough Neagh Landscape Partnership’s cultural education programmes, quarto was commissioned to develop and deliver a Reminiscence Programme, collecting and recording stories and recollections about fishing, boats, industry, World War II and folklore & traditions from Lough Neagh. The programme recorded stories and experiences relating to the shared cultural heritage and history of Lough Neagh, increasing understanding of the cultural and social relationships around the Lough and developing a resource that will contribute to a greater understanding of local heritage. In partnership with Ulidia Heritage, quarto carried out a condition and access audit of defence heritage features within the Binevenagh area and made project proposals to increase public access, education and engagement with that heritage. Our proposals have contributed towards a development application to the Heritage Lottery Fund by Causeway Coast and Glens Heritage Trust to establish a new Binevenagh and Coastal Lowlands Landscape Partnership. On the Brink: The Politics of Conflict 1914-1916 was a three-year project delivered in partnership by Mid-Antrim and Causeway Museums Services. It explored the history and legacy of war and revolution between 1914 and 1916 through exhibitions, events, learning activities and volunteer training. quarto was involved in a number of aspects of the project; we produced a body of research on memorials and other relevant sites of remembrance, designed and delivered a programme of learning workshops for secondary schools and adult community groups, and supported the delivery of the volunteer programme. Supported by the Esmée Fairbairn Foundation, Causeway Coast and Glens Borough Council developed three year project to increase access to the Sam Henry Collection held by Coleraine Museum. Sam Henry: Connecting with the Past, Collecting for the Future will reveal previously undocumented aspects of the collection and inspire local communities to create new collections of cultural identity. quarto was contracted to deliver the first and second phases of the community engagement programme, encouraging local community groups to engage with Sam Henry as a person, collector, antiquarian, folklorist, writer and musician, and supporting them to curate and deliver a public events programme. Sperrins Townlands Project aimed to document and engage people with the history and heritage of townlands across the Sperrins Gateway Landscape Partnership area. quarto were commissioned to carry out research into local place names, conduct oral history interviews, and design and deliver a programme of community engagement workshops. The research will be developed into local publications and contribute to community archives in local libraries and online. A Corrymeela Community Project supported by the Republic of Ireland’s Department of Foreign Affairs. Running through 2015, it aims to engage civic society with the question of what a ‘shared future’ means on the island of Ireland. 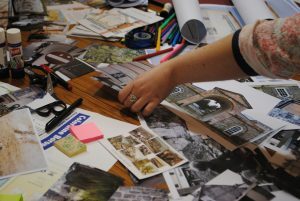 quarto has been commissioned to make a visual record of each 20/20 Visions workshop, with the resulting artwork to be exhibited at the end of the project. An Arts and Humanities Research Council-funded project led by Ulster University (with the former Department of Culture, Arts and Leisure, the Community Relations Council, PSNI and The Junction in Derry), it aimed to profile non-violent and transformative commemorative practice in local communities and to create spaces for dialogue, exchange and advocacy with public bodies. 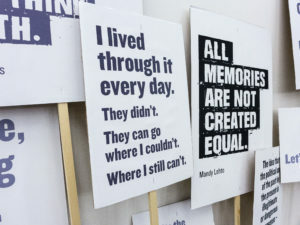 quarto was commissioned to design, facilitate and evaluate the outcomes of community dialogues during the residential programme and to curate an exhibition exploring some of those outcomes. In 2014 we delivered our second project for the Causeway Coast and Glens Heritage Trust exploring the cultural heritage of place names. quarto were commissioned to research place names within the Causeway AONB through archives, GIS mapping and interviews with local landowners. We interpreted the information collected to produce a touring exhibition and an educational resource designed for local primary schools. In September 2013 quarto designed and facilitated a creative mapping workshop with participants at the Heritage Practice in Contested Spaces seminar. The event was delivered by the Causeway Museum Service with MINOM, an affiliate of UNESCO International Council of Museums, and supported by the Community Relations Council and the North East Peace III Partnership. Between 2012 and 2014 we worked on this HLF-funded project for the RNIB, researching and writing a publication (in text, Braille and audio formats), carrying out oral history interviews and producing an accessible exhibition. In 2013 we were commissioned by the Northern Ireland Museums Council to research and collate information required for a successful Stage 2 Heritage Lottery Fund Skills for the Future application. In consultation with local museums, the Development Plan produced a framework for the delivery of the project, providing information on the aims and anticipated outcomes of the programme, an outline training plan and supplementary information on the roles, responsibilities and recruitment of project staff, participants and trainers. In 2012 and 2013 we researched townland and field names in the Binevenagh AONB for Causeway Coast and Glens Heritage Trust, through archives and fieldwork. The research was developed into a touring exhibition and worksheets for use in schools. In 2012 and 2013 we carried out a series of oral history interviews for the Belfast Hills Partnership with people living in north and west Belfast on life in the hills. Excerpts from these interviews are available to listen to here http://belfasthills.org/history-culture/oral-histories/.